The School of Music awards scholarships to talented students on the basis of an audition and academic factors in their application, regardless of intended major. These competitive awards are contingent upon admission to Puget Sound and enrollment as a full-time student. The School of Music offers scholarships for all band and orchestral instruments, voice, piano, organ, and jazz. 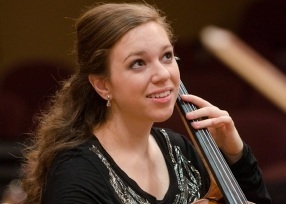 Scholarship recipients are required to maintain academic standards, take studio lessons on their major instrument, and participate in ensembles or serve as accompanists. Music scholarships are in addition to merit scholarships. The awarding of music scholarships considers both the quality of the audition and the potential contribution to the School of Music. Students who receive music scholarships may also be considered for need-based aid, if applicable. Please visit Financing Your Education for helpful information and planning resources. To apply for a music scholarship, you must complete the Music Audition Application to schedule an audition. A video-recorded audition will be considered for those who live more than 200 miles away from an audition location, but priority is given to those students who complete live auditions. Please review the entrance audition requirements for your specific instrument.